To many people looking to lose weight, cardio exercise means running… and that’s it. So if you don’t like rapidly planting one foot in front of the other for miles at a stretch, chances are you don’t do it. Or you give it half effort on the rare occasion you do lace up your sneakers. But there are plenty of other ways to get your cardio on, most of which can help you boost heart health, build muscle and strength, and reach or maintain your goal weight — it all depends on how you do them. Following is everything you need to know about cardio exercises for weight loss, strength, and endurance. Although we think of “cardio” as activities like running, cycling, and swimming, cardiorespiratory exercise is anything that elevates the heart rate and challenges the body to deliver oxygen to working muscles, explains Pete McCall, C.S.C.S., an ACE-certified personal trainer and host of the All About Fitness podcast. “The cardiac system pumps blood around the body, and the respiratory system draws oxygen in and around the body. Any exercise that engages these systems and keeps them going is cardiorespiratory,” he says. Two more terms that get thrown around along with cardio are “aerobic” and “anaerobic.” These designations refer to how much oxygen is used to produce energy for the task at hand. While each energy system is always in use to some extent, the intensity of activity determines which form of fuel is utilized more. Aerobic exercise relies primarily on oxygen to produce energy, and is performed at low or moderate intensity for an extended period of time (more than 2 minutes or so) due to the length of time necessary to produce that energy. Examples: marathon running, swimming, road cycling, etc. Anaerobic exercise, on the other hand, does not emphasize oxygen as its main source of energy, relying more on ready glycogen and phosphocreatine. Anaerobic activity is performed in bursts (up to 2 minutes or so) at high intensities. The anaerobic threshold — at which you cross over from aerobic into anaerobic activity — varies from person to person, but generally starts around 80 percent of your max heart rate, says Beachbody fitness expert Cody Braun. Here’s a formula that can help you determine your max heart rate. For example, if you’re 30 years old, your age-adjusted maximum heart rate is 220 minus 30 years = 190 bpm. From there, calculate appropriate percentages of that number to determine your target zones. In this case, 80 percent (the anaerobic threshold) is about 152 beats per minute. You can use a heart rate monitor to track your BPMs during exercise to make sure you’re adequately challenging yourself relative to your objectives. If you prefer an even simpler way of tracking your effort, there’s the talk test. Can you carry on a conversation? If not, you’re doing anaerobic work. Another way to gauge the intensity of activity is the rate of perceived exertion (RPE) — basically, how hard you feel you’re working. The RPE scale runs from six to 20, which roughly corresponds with your heart rate divided by 10. At rest, your RPE is six. Light activity lands you at 11, hard work gets you up to 15, and all-out maximal exertion takes you up to 20. Like all exercise, cardiorespiratory workouts offer a slew of perks. “Cardio improves circulation of blood and oxygen, allows you to exert yourself longer without being fatigued, helps make the heart more efficient, burns off calories, helps you sleep, gives you more energy, and reduces stress,” says Michele Olson, Ph.D., professor of sport science at Huntingdon College. Cardio can even help you become stronger. “Enhancing aerobic capacity can improve blood, oxygen, and nutrient flow to working muscles, and help with recovery between sets of resistance-training exercises,” McCall says. Of course, chief among the benefits of cardio for many people is weight loss. Research has long found that both endurance and interval training improve body composition, decrease waist circumference, and lead to similar amounts of weight loss. However, high-intensity exercise has been found to trump aerobic exercise at decreasing body fat, owing primarily to the afterburn effect of excess post-exercise oxygen consumption (EPOC). Where steady-state (low to moderate intensity) activity may burn more calories during its typically longer durations, high-intensity exercise keeps your metabolism elevated long after a workout, in some cases up to 72 hours. That means more calories burned overall. And since interval training takes less time to get the same results, many prefer it. In a small study published in 2016, a group of sedentary men was split into two groups who exercised three times a week for 3 months: one group did moderate-intensity cycling for 45 minutes, while the other alternated three 20-second cycle sprints with low-intensity pedaling for 10 minutes. At the end of the experiment, both groups lost about 2 percent of their body fat. But the second group worked for one-fifth as much time as the first. “With HIIT, you are utilizing all your systems efficiently — you’re getting the biggest bang for your buck in the shortest time,” Braun says. The American College of Sports Medicine recommends adults get at least 2 1/2 hours of moderate-intensity cardio, or 60 minutes of high-intensity cardio, each week for general fitness. That works out to 30 minutes 5 days a week, or 20 minutes 3 days a week, respectively. But you can split up that time within the day, too. For instance, that can be 15 minutes of jump rope in the morning and 15 minutes of soccer with your kids in the afternoon. 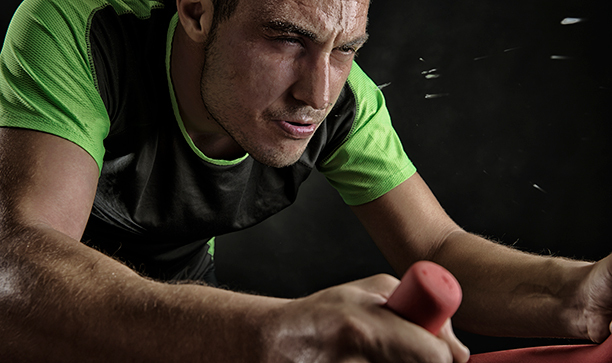 Just be sure to push yourself (and pay attention to your heart rate) if you’re aiming for more vigorous cardio. If you’re newer to cardio, McCall suggests setting a small, realistic goal, such as 15 minutes, three times a week. “If you’re successful at achieving this, that will encourage you to add more,” he says. From there, add 5 to 10 percent more cardio each week. So, 15 minutes becomes 17 minutes, and then 20 minutes, etc. You can add 5 to 10 percent more mileage if you prefer to use distance as your measurement. It’s OK to do some form of cardio every day, as long as you’re not doing super intense workouts daily. If you put in a hard day, make the one that follows an active recovery day with a walk or perhaps yoga. “Exercise is a stress, and your body needs days to recover and heal itself,” Braun says. For those who favor a combination strength-and-cardio workout, Braun recommends doing strength first. “The body likes to use carbs before fat for energy,” he explains. “Strength training uses glycogen for energy. Once those stores are depleted, your body will turn to fat deposits during lower-intensity cardio.” Further, if you do high-intensity cardio first, you may not have the strength to give weightlifting your all, and your form might suffer. The method by which you perform cardio is as important to your goals as the exercises themselves. The following strategies alter variables like tempo, rest, and even activity. This is steady-state cardio, wherein you maintain roughly the same pace throughout a workout. You can do this with any of the cardio exercises listed below. You’ll burn calories and train your body to consume oxygen more efficiently, but you won’t build much strength, and you’re likely to lose some muscle. As mentioned above, alternating between periods of high-intensity bursts (such as sprinting) and lower-intensity rest or recovery (such as jogging or walking) will burn more calories in less time. It also generally burns more fat overall, improves anaerobic capacity, and helps your body recover quicker. HIIT isn’t the only way to get your intervals on. “Doing lower-intensity exercise for 1 to 2 minutes at time uses the aerobic energy pathways without creating excessive fatigue,” McCall explains. He recommends exerting at a 5 to 7 (on a scale of 1 to 10, with 10 being the hardest) with a 2-to-1 work-to-recovery ratio. So go 2 minutes at a level 7, then 1 minute at a level 4, for example. This type of total-body workout involves performing a number of different exercises in succession (a circuit) with minimal rest in between. It typically involves combining cardio and strength training, though Olson notes it isn’t optimal for either. For weight loss, however, it can be quite effective. Alternate between exercises such as squat lunges, burpees, medicine ball passes, and mountain climbers for 30 to 60 seconds each, then rest a minute between rounds. This funny Swedish term is a great way to break up the monotony of regimented intervals, McCall says. Work at a high intensity for some distance (say, eight lightposts away) or time (until the second verse of the song you’re listening to). Then go at an easy effort until you recover. Continue this pattern for different distances or times for your entire workout. You now know what cardio is and how it’s applied — here are the cardio exercises to try. Easy to do most anywhere and fairly cheap, running offers a slew of benefits, like strengthening bones and enhancing joint health. However, “the repetitive impact can cause lower-extremity overuse injuries if you don’t vary it with other forms of exercise,” Olson says. To help avoid injury, make sure you’re running with proper form. Easier on your joints than running, biking challenges your body to effectively deliver oxygen to muscles, which offers a greater likelihood for growth. Another great option if you have joint issues, swimming is a total-body workout. But you do need a place to swim — and to know how to properly swim — to reap all of its benefits. Once you do, check out these tips to improve your freestyle stroke. Crew teams are in top shape because rowing is a great total-body cardio and muscular workout. It’s also low-impact, sparing shock to joints. This kind of exercise most often refers to jump training, and can burn many calories as you increase your explosive power. Naturally, though, good form is a must for this high-impact activity, or you increase the risk of injury. “You need to have the best movement mechanics to do plyometric training,” Braun says. Who says cardio can’t be fun? Whether you prefer moving to pop music, country music, or something in between, dancing is a great way to improve aerobic — and even anaerobic — capacity. Cheap, portable, and easy to do pretty much anywhere, jumping rope builds aerobic and anaerobic endurance, and may help improve coordination, balance, and bone mineral density, research shows. It’s best to wear the right shoes and jump on a forgiving surface such as a wood floor, Olson says. And if you have tight calves, stretch them before and after. “Consistent hiking for 2 to 4 hours at a time uses the aerobic energy system, which can help increase the utilization of fat for energy,” McCall says, and that can lead to weight loss. Hiking is also easier on your joints than running, plus you’re spending time in nature, which has been shown to improve mood among other benefits. Old-school bodyweight exercises like squats and pushups are a great way to get your heart pumping and build muscular endurance. “The more muscles used, the more oxygen required, and the more calories burned,” McCall says. Try jumping jacks, high knees, ice skaters, mountain climbers, and burpees. You can get the benefits of cardio in many more ways than simply running. Whether you swim, dance, or do Beachbody workouts at home, be sure to do more than one thing. “Your body is capable of a lot of things. For general health and fitness, encompass all of it,” Braun says. Do endurance as well as interval workouts, in all forms of cardio, to lose weight, improve overall fitness, and reduce your risk of injury.